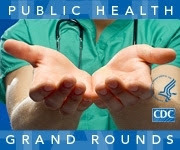 The "Hypertension: Detect, Connect, Control" session of CDC Public Health Grand Rounds on Tuesday, May 21at 11am (MT) will explore hypertension, or high blood pressure. Having high blood pressure increases the risk for cardiovascular disease, the leading cause of death in the United States. Nearly 800,000 people die in the United States each year from cardiovascular disease, which is 1 out of every 3 deaths. Registration is not required to watch the live webcast of Grand Rounds; however, you must register for continuing education credits.